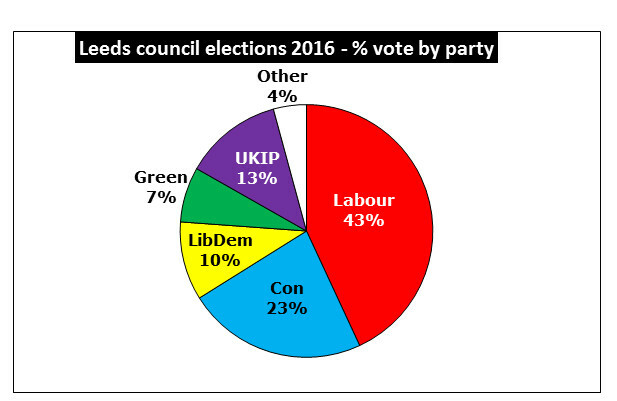 Some facts and figures from yesterday’s vote in the Leeds City Council elections (in which none of the 33 seats up for grabs changed hands). 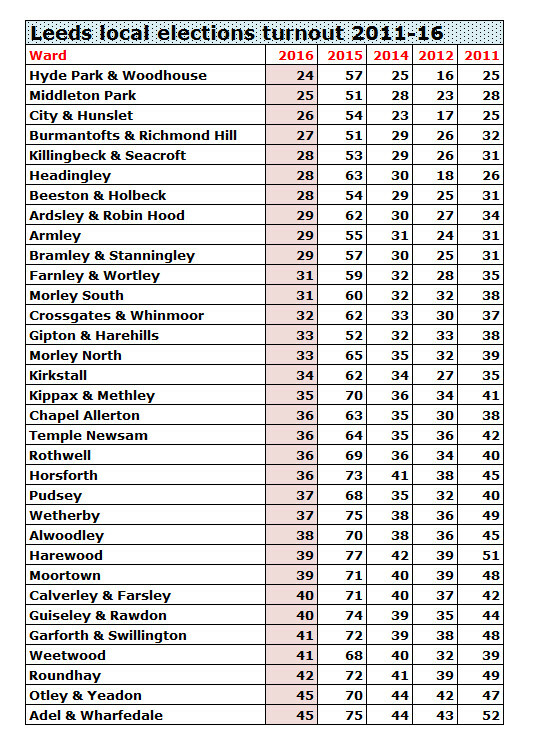 Labour’s percentage vote in the city was up 3% compared to 2015, but still 4% adrift of the vote it achieved under Miliband in 2011, when we were at the same point in the election cycle. The Tories’ vote share fell 4% compared to last year, though they still polled better than they did in 2012 and 2013. After a torrid time last year, the LibDems are back up to where they were in 2014 – at 10% of the total votes, ahead again of the Greens, whose vote share dropped 2%. UKIP is pretty much going nowhere. 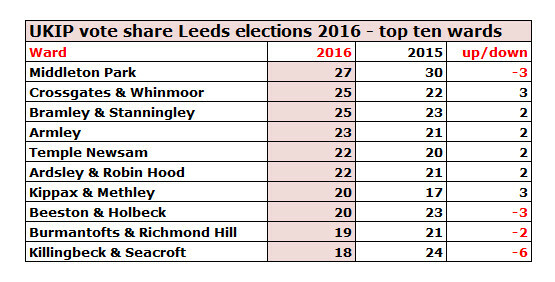 While it improved its vote share where you’d expect, it’s stuck on 13% overall and doesn’t look any nearer to making a breakthrough and getting its first Leeds councillor. Its momentum in Middleton Park – where it had its best chance – stalled and fell back below the 30% it recorded last year. Nothing remarkable in the turnout either. Despite (or is that because of) the good weather, fewer voters turned out in just about every ward compared to 2011, the last time we were at this stage of the general election cycle. This entry was posted in Uncategorized and tagged 2016, council elections, labour party, leeds, leeds city council, local elections, turnout, UKIP. Bookmark the permalink. How do you know what the ‘class’ status of any of the people who voted was? I naively thought we were getting away from those outdated kinds of distinctions. Clearly not. Sorry for being crass. Have a look at where people vote most and least. If it isn’t class, what is it? Open to suggestions. I wonder if the Leeds citizen is going to write anything about planning permission for green belt land being given to mulillionaire developers caddicks in tingle my and weetwood so they can build more corporate booths at headingley stadium! Land that was rejected by council planners only to be mysteriously approved!?! I smell a rat does anyone else? Maybe these new councillors can help stop it?? ?